Butterfly Reflections, Ink. : Still Younger Than You, Crazy Dog! 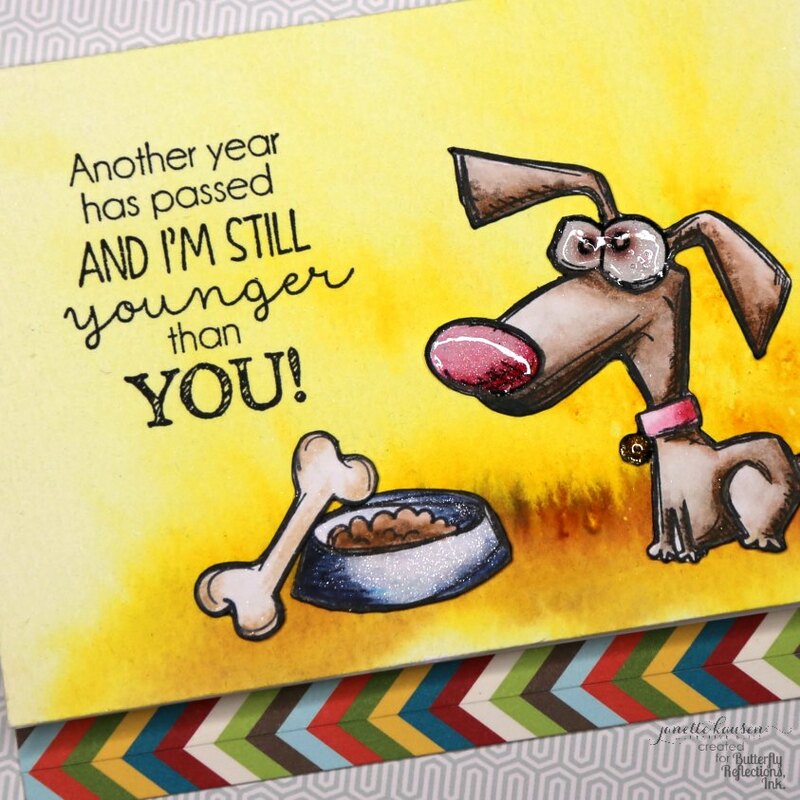 Still Younger Than You, Crazy Dog! Happy Sunday, BRI friends! 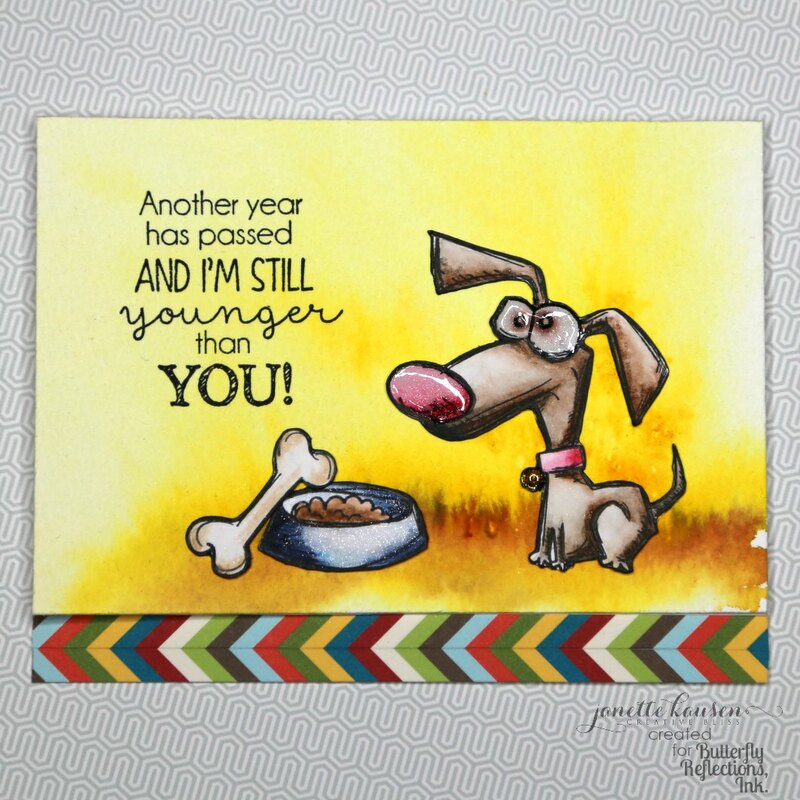 I'm Janette and I'm bringing you a card made for one of my besties who has a birthday today. Shh, don't tell her... I won't see her until Tuesday! The Crazy Dog stamp set is just too fun! So many doggies to create so many paper crafts! I chose this guy with a few accessories and colored them with Distress Crayons in Walnut Stain, Vintage Photo, Festive Berries, Black Soot, Antique Linen, Chipped Sapphire and a water brush. The background was easy peasy with Color Burst watercolor powders. I saturated the watercolor paper with clear water and spritzed a bit of Lemon Yellow across the paper. I waited for the water to dry a tad and added a sprinkle of Sepia to my craft mat. I then picked it up with a damp brush and drew it across the watercolor paper. The Sepia creeped up into the yellow creating a grassy look in which Fido could play. Add a touch of water for a blended look below. I stamped the sentiment from the Taylored Expressions Another Year Older set and adhered the fussy cut Fido and accessories. Fido was spiffed up with Clear, Smoked Quartz and Spun Gold Sparkle Pens and Glossy Accents. The finishing touch for this card is the bottom border. The chevron adds such a fun effect. It is an A2 size card with 1/2 inch trimmed off the front flap to reveal the inside panel. This was done with 2 strips of MFT's Trail Mix paper. The paper had diagonal stripes to begin with. I trimmed a 1/4 inch off each the top and side so that the colors would align next to each other and adhered them. Super simple, super fun! I hope your day is just as blessed as it can be and thank you all for stopping by! 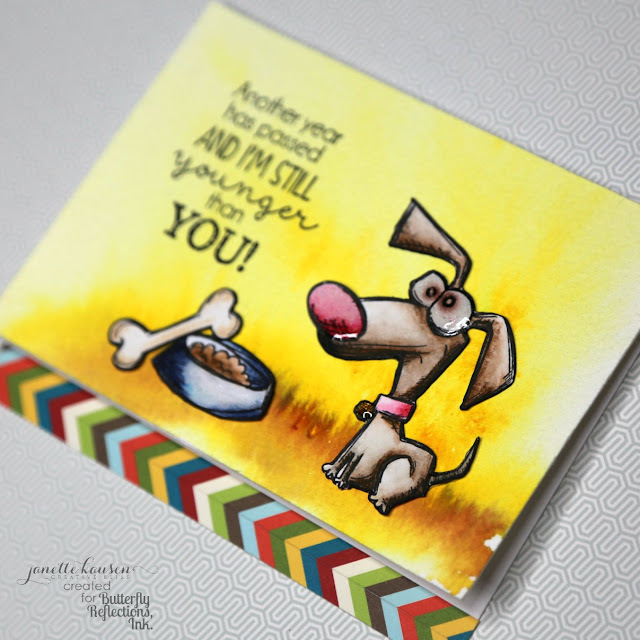 I absolutely love this card Janette! Love the use of yellow,and all the little extras on Fido. It is beautifully coloured and the chevron strip is the perfect finishing touch. So fun! Adorable! I love his eyes too!